Whispers in the Loggia: Burke to ND: "Come Clean"
Burke to ND: "Come Clean"
How can the Church do that? According to the wires, the church's "chief justice" slammed the Obama administration for "so aggressively advancing an anti-life and anti-family agenda." The former St Louis archbishop "told Catholics Friday morning that Catholic universities should not honor those who teach and act publicly against the moral law," the AP reported. 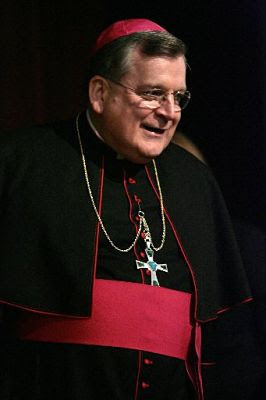 Burke likewise deemed the President's selection of Kathleen Sebelius -- a pro-choice Catholic -- as Secretary of Health and Human Services "necessarily the source of the deepest embarrassment to Catholics and a painful reminder of the most serious responsibility of Catholics to uphold the moral law." SVILUPPO: Fulltext of Burke's keynote has been posted. "Every One of Us Is a Pilgrim"
"As a Pilgrim of Peace"
To Burke's YouTube, Wuerl's "You Face"
"Thanks God... and Thanks Mom"
"Meet Me in St Louis"